Gastritis is acid damage to stomach mucosa leading to transient inflammation because there is breach in epithelium of the mucosa after erosion of the mucus layer above the mucosa epithelium. 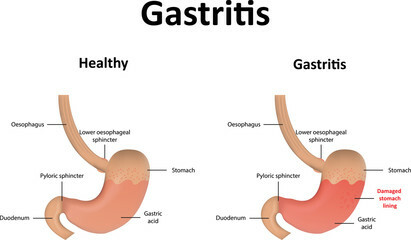 Gastritis can be acute or chronic. Acute Gastritis: Erosion of the stomach mucosa hence enable the gastric acid to cause mucosal damage. They car commonly caused by NSAIDs, Smoking/Stress, Alcohol ingestion, Infections like helicobacter pylori and other stresses like (uremia, trauma, burn, sepsis, multiorgan failure). Smoking is another risk factor for gastritis as well. Severe Stress: Severe burns (Curling ulcers) – hypovolemia leads to decrease blood supply, shock, increased intracranial pressure (ICP) in (Cushing ulcers) increase the vagus stimulation targeting the parietal cells, hence producing more acid. Trauma/surgery injury to central nervous system (CNS) can also cause acute gastritis and eventually stress ulcers. Infection by H.pylori cause chronic gastritis but go through an acute phase. Autoimmune Gastritis: Another cause of chronic gastritis is autoimmune gastritis where the antibody target the parietal cells. This can also cause gastritis and also vitamin B12 deficiency. Sometimes if severe erosive gastritis can present with epigastric pain, nausea vomiting, hemetemesis (that are coffee brown), melena (black feces). The most definitive diagnosis of gastritis is upper endoscopy the same diagnostic tool for cancer, ulcer, dyspepsia and biopsy procedures. Testing for H.pylori can be recommend if symptoms of epigastric pain persist. All epigastric pain symptoms that give different differential diagnosis can be possibly caused by H.pylori and hence must be tested to treat promptly. The following are the 4 test used to check for H.pylori. Stool antigen test: Can tell new or old disease because only positive in active infection. Upper endoscopy is the most accurate test but more invasive of the four. Helicobacter pylori infection can cause Acute/Chronic Gastritis → Peptic ulcer disease → which can lead to Intestinal Metaplasia Gastric Cancer or MALToma. Autoimmune gastritis can also cause Chronic Gastritis which can also lead to Intestinal Metaplasia and Gastric cancer. Gastritis from atropic autoimmuen gastritis can also cause vitamin B12 deficiency. The initial management approach for gastritis is to stop all NSAIDs and all other risk factors. If there is no alarming symptoms, patient can be managed with empirical PPI for 8 weeks: PPI is better than H2 blockers, antacids, sucralfate can be used. If patient symptoms are not responsive to 8 weeks of empirical PPI, upper endoscopy is warranted.